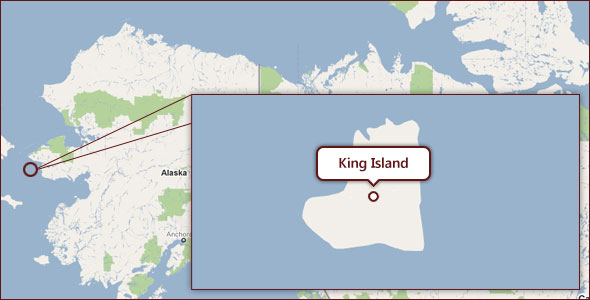 Located about 40 miles west of Cape Douglas, King Island is the former home to a distinct group of Inupiaq Eskimos. The village site was originally called Ukivok, but the island itself was named King Island in 1778 by English explorer Captain James Cook. At the beginning of the 20th century, there were about 200 residents dwelling on King Island. The village site, consisting of walrus skin dwellings, was perched precariously on the side of the island's steep cliffs. The Inupiat subsisted on walrus, seal, beluga whale, fish and crab from the sea, while hunting birds and gathering plants, berries and bird eggs from the island. Each summer they would migrate to the mainland Seward Peninsula to subsist and, after the establishment of Nome around 1900, to trade and sell their exquisite ivory carvings. With the exposure to outsiders came disease and by the turn of the 20th century it had claimed about one third of the population of King Island. As time went on more King Islanders remained in Nome instead of returning home for the winter months, lured away by job opportunities and medical care. When the BIA's (Bureau of Indian Affairs) condemned the schoolhouse, this finally forced the last remaining natives to leave their home for good and by 1970 most had relocated to Nome. To this day, they attempt to reach the island each year by boat to hunt, gather and continue their traditional way of life. King Islanders maintain a strong identity and rich culture in Nome. Their renowned skill in carving ivory is as strong now as ever and continues to be a distinct aspect of their tradition, as well as an important source of income for artists and their families. VIEW WORK FROM KING ISLAND HERE.